First off, I would like to thank all the volunteers who have put in long hours away from their families to bring soccer to all of us. I would like to also thank all of you for your patience and continued support for NCSA/Concord FC! After being on the NCSA board as the Administrator of Programming since May of 2016, I was appointed the Director of Travel in December of 2016. Former Director Jim Enser had a desire to step down and focus more on coaching and mentoring the younger age groups as well as concentrating on serving as the Southern Tier District Commissioner for NYS West Soccer Association. We are very lucky as a club he hasn't stepped away completely. 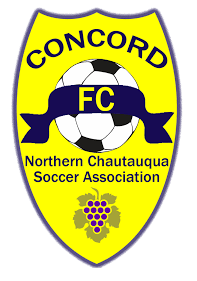 He, current and previous NCSA Board members, Concord FC travel committee members and other volunteers, have laid a solid foundation in which we will build off. With the NCSA vision and mission statements in mind, the Concord FC committee is determined to better our club. Our goals are to provide quality player development through exceptional coaches and volunteers, promote a love of soccer in our community and a healthy lifestyle, and inspire pride and the highest level of sportsmanship and professionalism in our players, coaches and parents. In the offseason, many aspects of the club were analyzed. Coach education, player safety and overall club efficiency were priorities. We ensured all coaches went through an extensive application process, and those that weren’t already, became USSF “F” licensed and were certified in the concussion protocol. NCSA implemented online registration and a more modern website through Demosphere Inc. and NCSA increased the use of social media to improve our communication. After Donald Lang stepped down to focus on his family, NCSA Acting President Jake Wilkins searched for a highly qualified Director of Coaching and one that shared our vision. He found that in Brett Gould, a Fredonia High School Varsity Girls Soccer Coach with an extensive soccer background. Brett was subsequently approved by the NCSA Board and he has been a terrific addition to our organization. Under Brett’s leadership, Concord FC for the first time, had try-outs for the upcoming Spring season. Brett describes try-outs as “an all-encompassing piece to assess readiness and help our coaches build their teams” and “by having a beginning and an end assessment, players and their families can easily see where their strengths, and areas of potential improvement are.” We also couldn't be more grateful for the Fredonia University Men's Soccer Coach, Patrick Gondek, coaching two of our 2017 Spring teams and offering guidance with administrative decisions. Coach Gondek is an asset to this club with the credentials he possesses. In addition, we have Fredonia Central School's Modified Soccer Coach, Aaron Pietro, as our Concord FC Fall Travel Director and a Spring coach plus many other very qualified coaches such as Nick Keefe, Chris Piede, Jim Rush, the Fredonia High School Varsity Boys Soccer Coach and Joe Michalak, a Fredonia High School Varsity Assistant Soccer Coach. Furthermore, our other 3 seasons of play opportunities, Fall, Winter Futsal, and Summer Rec, bring additional coaches with extensive soccer experience and among them are from Dunkirk City School. Zazh Meadows, the Varsity soccer coach helps with Winter Futsal and Fall, Jessica Gifford, the Girls Modified Soccer Coach helps with Winter Futsal and Phil Cook, the Varsity Girls Soccer coach helps with Summer Rec. All seasons of NCSA play contribute greatly to our Spring athletes' talent. Concord FC teams had many successes in this last Spring season including the 16U girls winning the Championship in the Clarence Classic and our 15U boys coming in Second Place in their Southern Tier division playoffs. Congratulations to coaches Brett Gould, Mark Maytum and Paul Sellari, another Fredonia High School Varsity girls soccer Coach! Looking forward, the CFC committee is reviewing a comprehensive policy and procedures manual to have a fair and efficiently run club. It is necessary to document the policies under which this club will operate. The committee expects to have that finalized soon. Concord FC is applying to the Buffalo & Western New York Junior Soccer League in conjunction with the Southern Tier Travel Soccer League to give our athletes more opportunities for various levels of play. With assistance from Coaches Shawn Taylor, Bernie Feldmann, and Mark Taylor, our 19U Boys team entered the BWNYJSL as a partner with The Lakeshore Club. This initiated a great relationship with that league which will hopefully facilitate our acceptance. The 19U team additionally played in 5 tournaments including College Showcases. Why should you choose NCSA/Concord FC this Spring? We provide quality coaching. We provide soccer to any level of athlete. We provide opportunities for your player to be successful in this club which will transfer to school sports and possibly a college soccer career. We instill leadership philosophies that each player could use to one day become coaches themselves and productive community members. We are going through changes yes, and changes are uncomfortable, but this will be a club you will want to commit to. Any parent having any other questions, may feel free to contact me at c.witkowski@ymail.com. Thank you again for choosing Concord FC!